So here we are, wrapped up the Super Bowl, on our route to the Oscars! 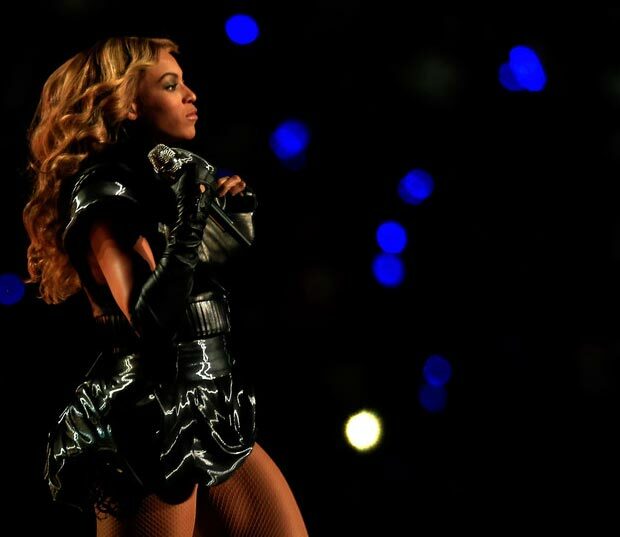 But before that, let’s discuss Beyonce and her glorious Super Bowl Halftime performance. And her black leather stage outfit. She has worked with the designer on previous occasions so it was not so much of a surprise that she turned to him for her Super Bowl halftime performance but mostly an honor and a true challenge. 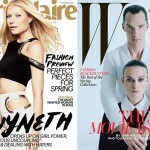 Fashion disasters happen on stage more often than ever, now that singers are more performers than just mere vocalists (not long ago I was reading a title reporting on a Lady Gaga stage outfit malfunction during one of her concerts, the back of her pants just came apart before her audience.) Beyonce can’t leave that to chance and since she’s such a ‘perfectionist’, her outfit had to be nothing short of flawlessly functional and perfect just like its wearer. Two months of work, 14 people pulling 200-man hours, five fittings for an entirely hand made stage ensemble: a leathery bodysuit with Chantilly lace skirt finish, a nylon, silk, plastic and metal micro mini and a motorcycle jacket with oversized shoulders, both of which she tore in the first minutes of the performance and threw into the audience. Her usual mesh tights, black knee high socks and laced up black booties. 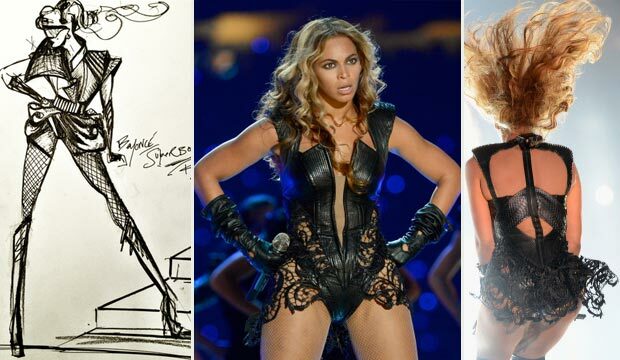 Rubin Singer also designed the jackets for the 120 backup singers and for Michelle Williams (Kelly Rowland’s Destiny Child Super Bowl segment stage outfit, although similar, was signed by Pucci). But that’s something the designer has a tradition for – his father created the costumes for the famous Russian Bolshoi Ballet. 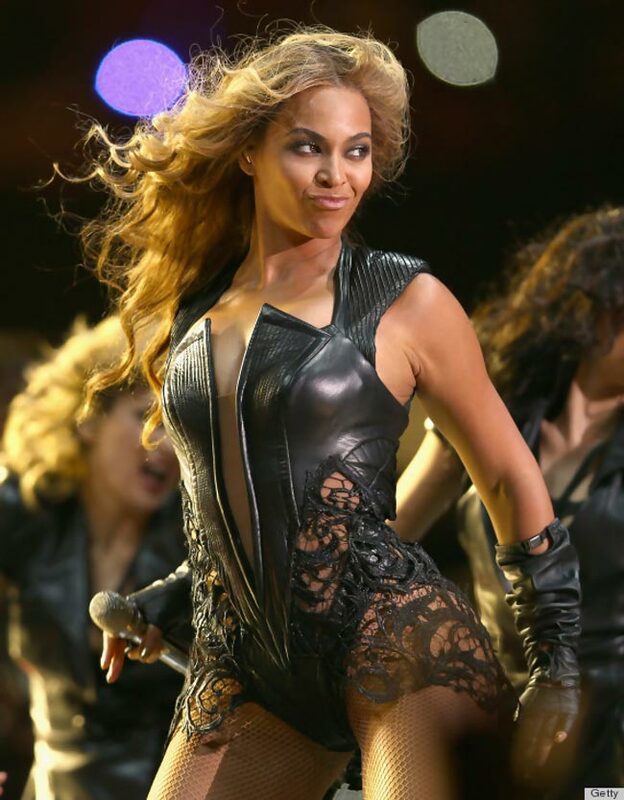 Enough about the outfit, let’s see what Beyonce’s nails wore for the Super Bowl Halftime performance! 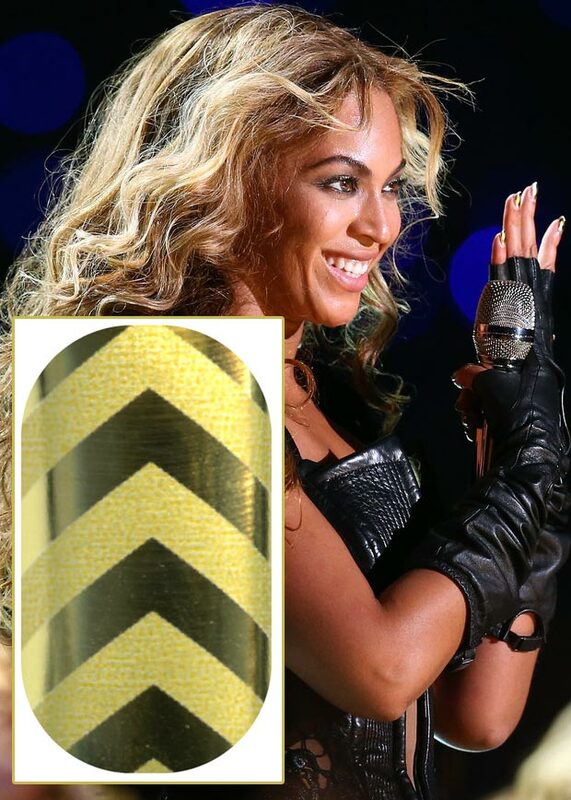 Beyonce was wearing Minx Gold and Matte Gold Chevron Nails! 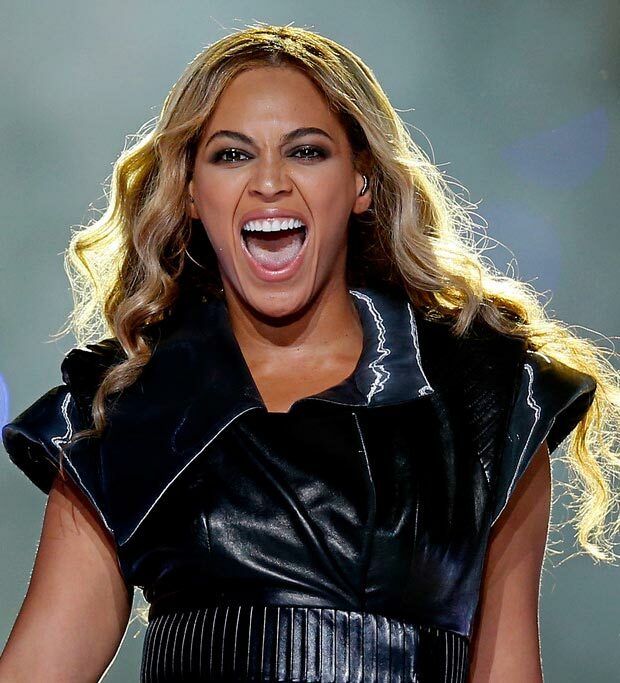 As we all know, Beyonce is a fan of Minx foiled manicure and she wore the exact same nails for her stunning National Anthem performance at the Super Bowl press conference last week. 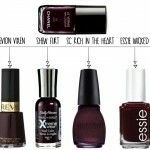 No wonder, as Minx manicured nails tend to last for two weeks (and up to 6 weeks for the pedicures). 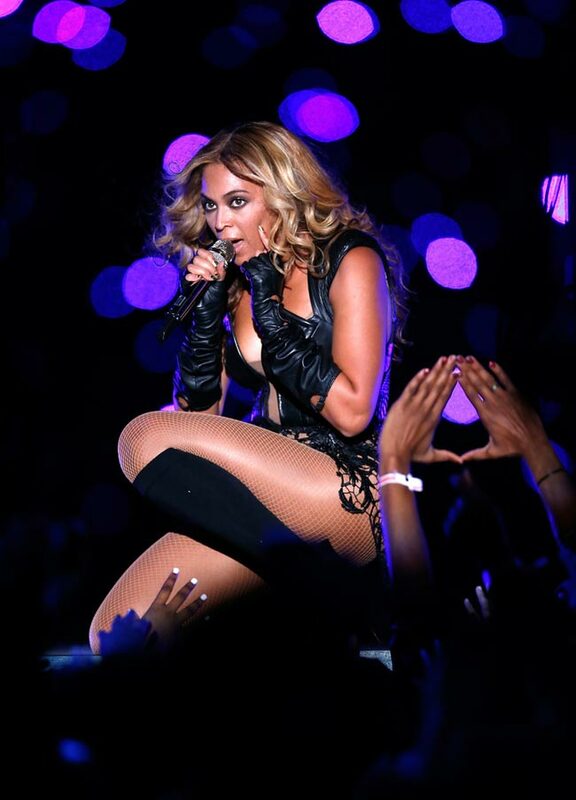 Beyonce was born to sing and perform! I would like to see her live one day as I am sure it would be a good show. It looks like she gave a good performance for halftime ( this is my first time seeing this as I cannot abide the Superbowl and American Football) and she looked great while doing it! Not to be negative but truth has to be told. 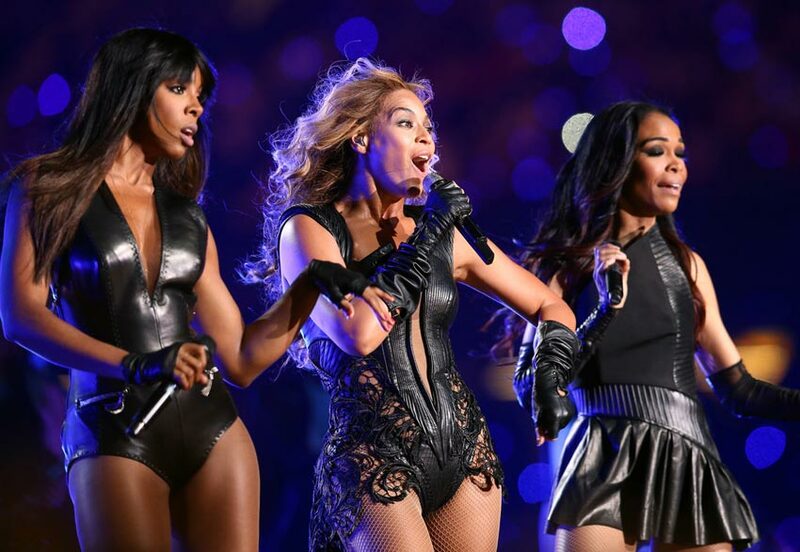 It was indeed nice to see Michelle and Kelly but since Beyonce’s mic was on a higher volume we couldn’t hardly hear these girls sing! I listened live with great headphones and checked it out later again twice. Does anyone of you hear them as loud as Ms Bey herself? Please, tell me because I don’t…? No you are spot on Appollonia, Queen B was the loudest. But then Destiny’s Child was supposed to be all about her any way. I didn’t like her outfit either. To dark. Too cheap Vegas despite the costs and craftsmanship. The dancing looked like angry fighting. Why so angry? Four months rehearsals for this and doing lip sync when it’s for her country? Guess Pepsi pays better. That’s what I would feel if I was an American. Jennifer Hudson and Alicia Keyes the glory goes to you girls! Not the Carter Brand.